Here at Beads Direct, we’re so excited to launch our online Swarovski Sweet Shop ahead of our appearance at The Handmade Fair (15/09/2017) with our partners Swarovski Create Your Style. 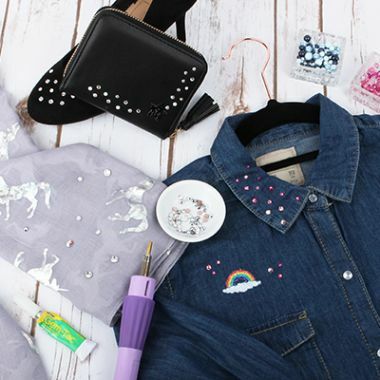 At the Swarovski Sweet Shop, you will find some of the beautifully coloured hotfix and non-hotfix crystals, pearls, beads, transfers and mixes to embellish your favourite things! Swarovski crystals are an essential part of your crafting stash if you love to add a touch of sparkle to your projects! You can embellish all kinds of things such as phone cases, gift cards, clothing, notepads, handbags and accessories with our beautiful Swarovski range. You can use sew on crystals, hotfix crystals and non-hotfix crystals to finish your crafty project or clothing designs. View our complete range of Swarovski crystals! What’s the difference between Hotfix and Non-Hotfix? Swarovski non-Hotfix crystals have a foiled back that you can hand-glue to your project. We recommend using Gem-Tac embellishing glue or Hypo Cement which is specially designed to apply Swarovski crystals to a range of materials including leather, fabric, ribbon, card, paper and more. Gem-Tac glue will semi-dry within half an hour of application but will take up to 24 hours to completely set and will turn transparent. Swarovski Hotfix crystals are designed to be used with a Hotfix applicator tool. The crystals have a thin layer of glue on the flat back which is heated up using the Hotfix applicator tool, and adheres directly onto your project. Hotfix crystals used with the applicator tool are great for projects that require a large amount of crystals because it is much faster, more precise and less messy than if you were to hand-glue them with non-Hotfix crystals. The glue on the back of Hotfix crystals is also much faster drying than Gem-Tac glue which can take up to 24 hours to completely set. We currently sell two different Hotfix applicators. The Hotfix Pro Touch Applicator Heat Tool for SS12-SS34 Hotfix Crystals which comes with 7 different applicator heads for crystals that measure 2mm-7mm. We also sell the Vacuum Applicator Heat Tool for SS6-SS20 Hotfix Crystals which is a cordless applicator that even assists in picking up the crystals with its vacuum suction that is controlled by a button above the nozzle. This applicator also has in-built light for accurate positioning in low-light conditions and can be used with smaller crystals from 1.9mm-4.9mm. Begin by laying out the crystals on your project surface where you want them to go. Starting with either the largest or smaller sizes crystal, choose and insert the relevant applicator head for your tool. Plug in your Hotfix applicator tool (if required to do so) and allow your applicator tool to heat up, this can take up to 10 minutes for the Hotfix Pro Touch Applicator Heat Tool. Starting from one corner of your project, take your applicator tool and place it onto of the crystal. Keep the tool in a vertical position and apply a gentle pressure. Hold for 10-30 seconds and remove the applicator tool. Test to see if the crystal has applied (be careful as it will be hot!). Continue to apply your crystals of the same size. If you are using a mix of sizes, you will need to switch off and allow your applicator tool to completely cool down before changing the head to a different size. When using non-Hotfix crystals and Gem-Tac on very small crystals, you may wish to use a headpin from your craft stash. Insert the tip of the headpin into the glue and brush it onto the back of the crystal. Then place the crystal into position and use the flat head of the headpin and press on the crystal to secure it into place. The time it takes to Hotfix a crystal will depend on the material you are applying it to. For example, small crystals on a flat, smooth surface such as paper, card or leather will take less time than a bigger crystal on more porous materials such as heavy fabrics. For this reason, you may wish to do a few tests to determine the length of time your crystals will take apply. Gently nudge the crystal (be careful as it will be hot) to see if it has applied after 10 or 20 seconds. Increase the time if necessary. Always take care when using the Hotfix applicator tool as the end will get very hot! Work on a clear surface and have somewhere safe, such as a heat resistant mat to store your tool in-between applying your crystals. Be careful not to look away or get distracted when applying Hotfix crystals to surfaces. If you apply too much pressure for too long, or tilt the Hotfix applicator away from the vertical axis, the crystal could slide out of place on the layer of melted glue. 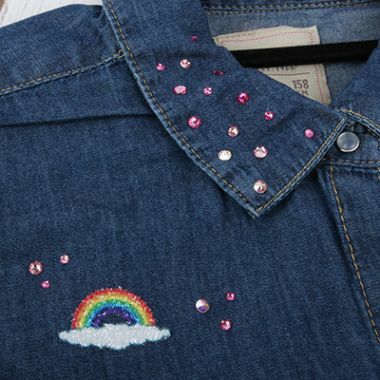 Crystal embellished denim collar with a Swarovski rainbow transfer. 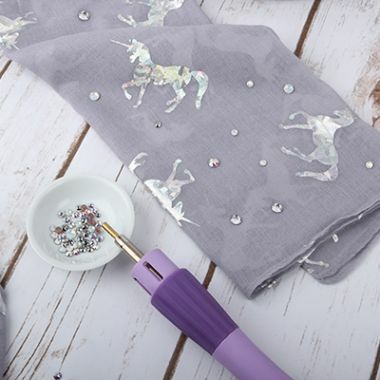 Embellished unicorn scarf with Swarovski crystal AB mix. 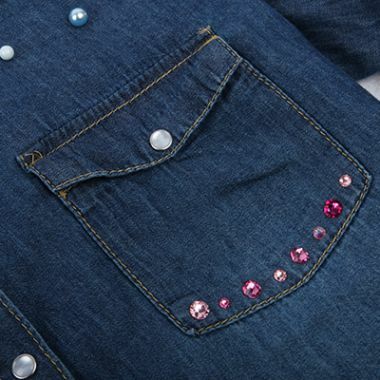 Pocket detail with Swarovski Hotfix crystal pink mix. Sparkly crystal embellished shoes and purse with a black Swarovski star transfer.